Ever played Mafia? It’s a party game where everyone is assigned the role of either a cop or a thief, and each person tries to convince the crowd that he’s the good guy. For the last few weeks, we’ve been playing Mafia almost 24/7 — except this time it’s not at a party, it’s on Telegram. 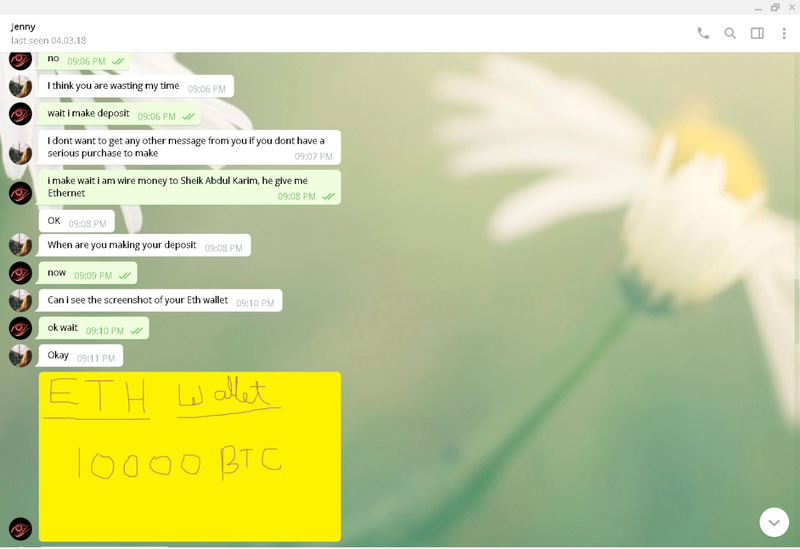 What was once touted a refreshing change to Whatsapp, has now become a breeding ground for a garden variety of scammers, spammers and snake oil salesmen. In some ways, the anonymity Telegram provides a user is useful; but in my personal opinion, Telegram places an extremely high barrier of entry to newbie crypto investors that are just entering the ICO market. I can think of at least 5 people I personally know who would have lost money on Telegram — and that’s not a good thing. While a portion of the community claims you need to have the basic intelligence to tell a scammer apart from the crowd if you’re going to “make it” as a crypto-investor, I’d like to disagree. As early champions of this nascent space, we’ve got to build a safe space for newcomers to get a feel of the waters before they dive in and start throwing words like “hodl” around. It kind of is our responsibility, especially as the ecosystem matures. With Enkidu’s ICO around the corner, we thought we’d write an article about some of our more hilarious and bizarre encounters within the wild wild west that is Telegram! 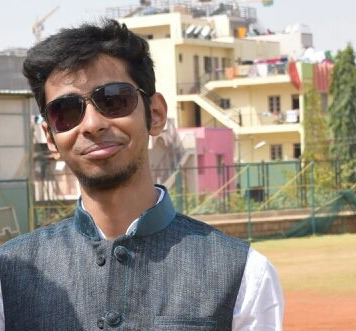 Shashank from our team often manages the telegram community channel. Imagine my surprise, when he messages me asking me if I’m “pleased with Enkidu’s service”. If someone PMs you on Telegram, it’s very hard to tell the difference between real and fake. Sometimes, there’s a one letter difference in usernames, but when you’re extremely busy, you fail to notice it. 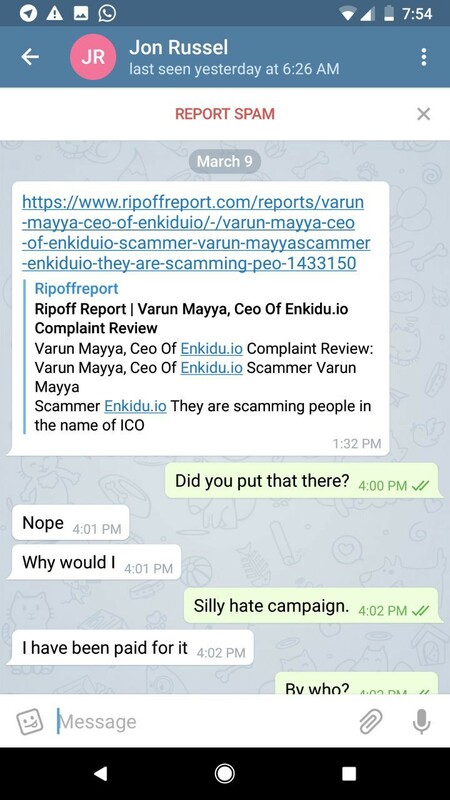 Because anyone can send anyone a text on telegram, impersonators can easily convince an unsuspecting individual that they’re part of the ICO team and solicit funds. 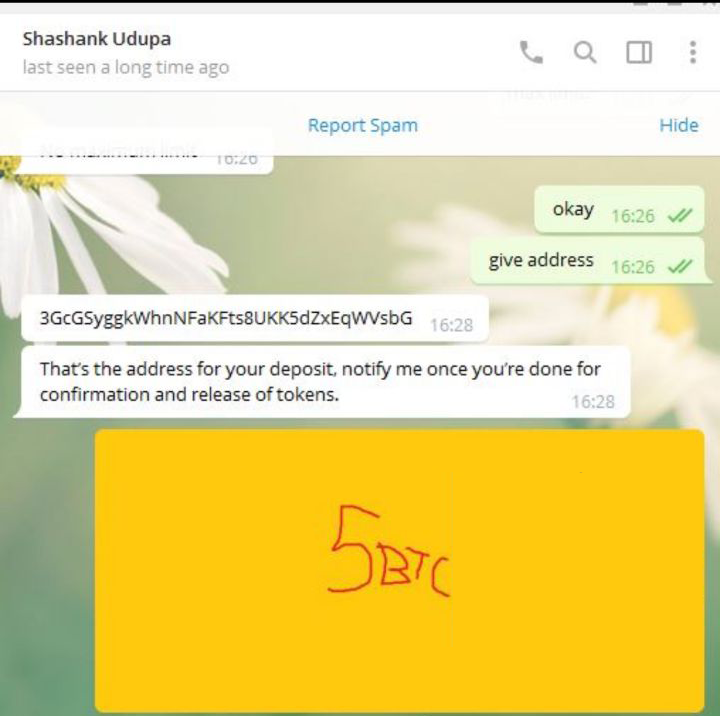 What’s more, just 5 minutes before our presale went live, these folks appeared out of nowhere and sent everyone on our telegram groups a PM, asking them to transfer funds to their own accounts. Lucky for us, we have a smart bunch of investors, who ignored the scammers outright. Probably doesn’t get out much, poor soul. 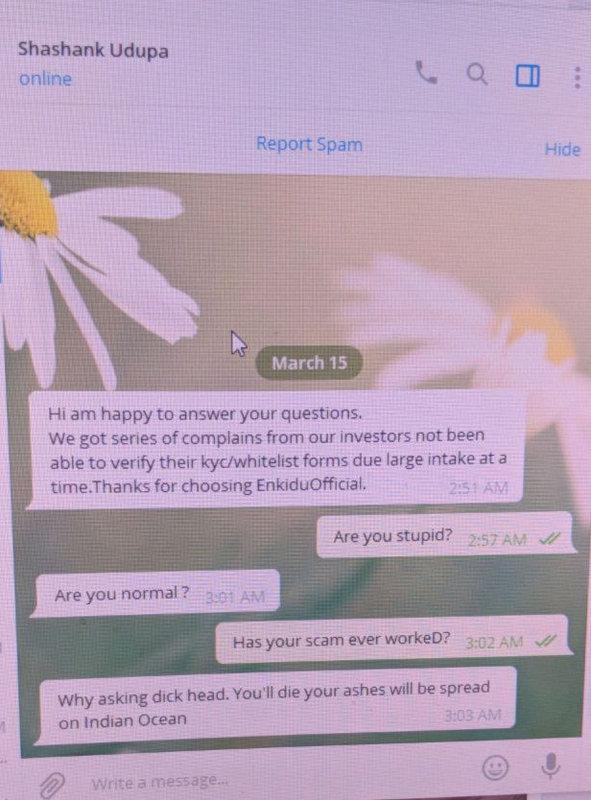 At Enkidu, we have our own solution to these scammers. 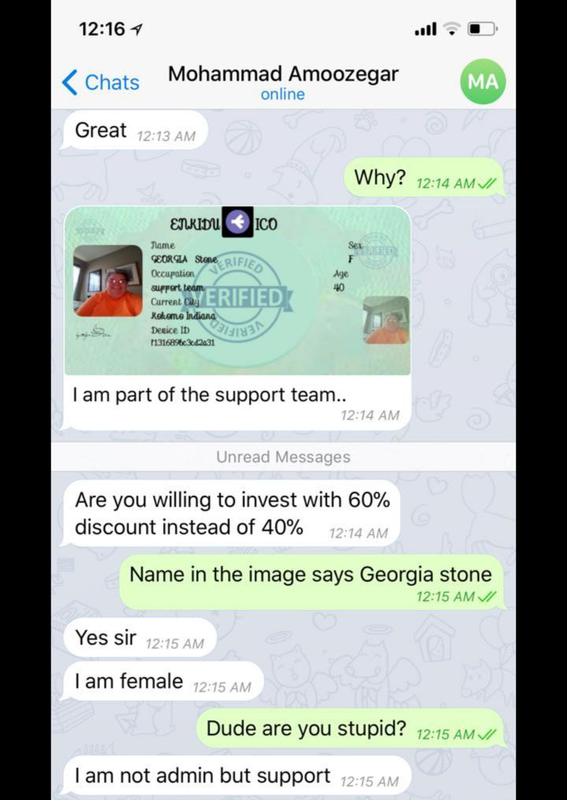 Seems like we’ll have to build a counter scam team soon. Job description? Must be good at MS Paint! It’s beyond my understanding how far some people can go. 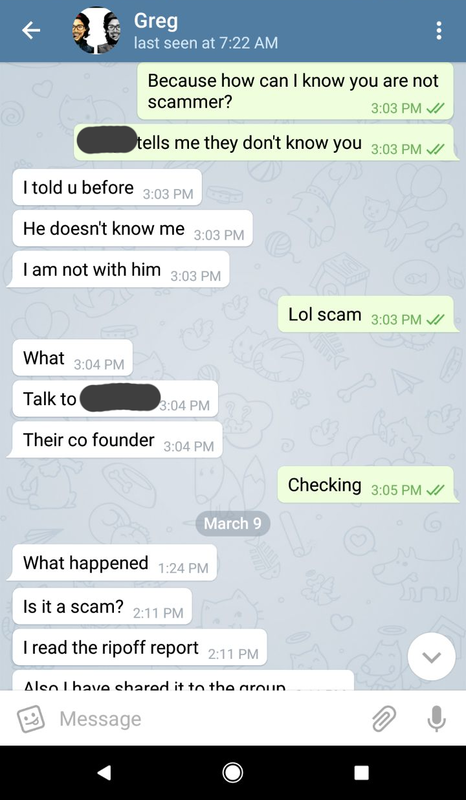 This was another classic scammer who reached out to random members of the group, one our team members being a victim too. The only difference was that this person had an Enkidu “ID” card sent along, to “prove” he or she was a legit person. 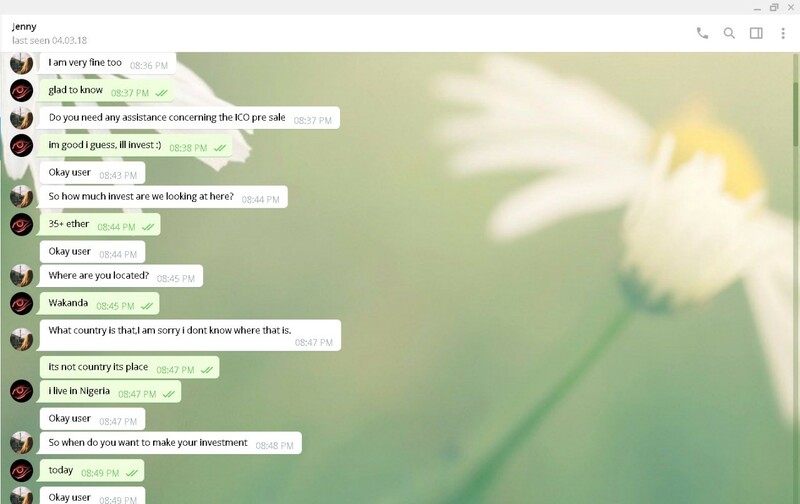 Of course, this person wasn’t very smart, as the name on Telegram and the name on the ID sent were completely different. On further inspection, this is what the ID card looked like. 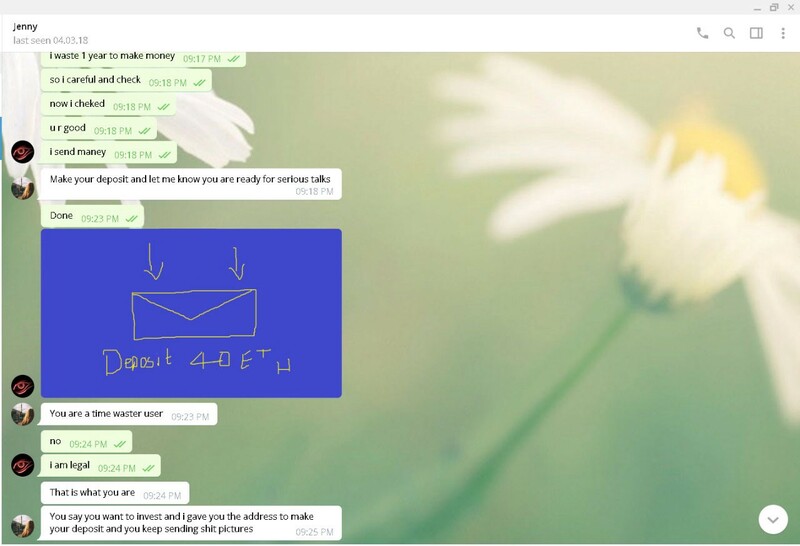 Again, welcome to Telegram. 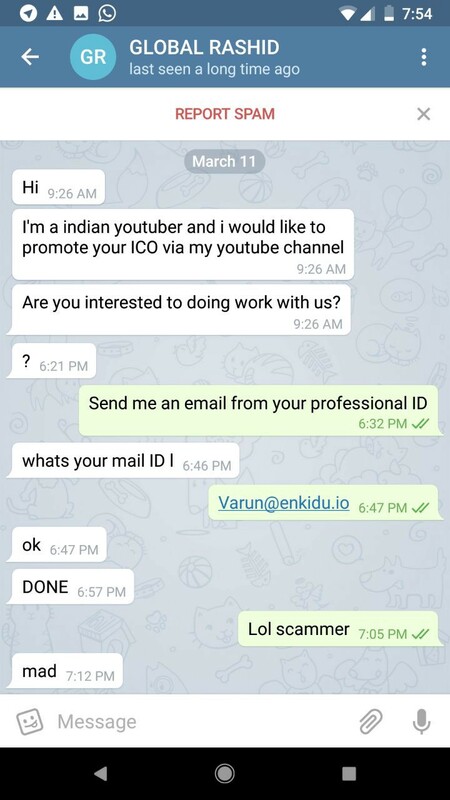 Every 4 hours or so, a random user pops in to the telegram channel with the DP of a famous Youtube Influencer. For us, it was a copy of The Modern Investor who entered our doors and asked us if we’d like him to feature us on his channel. 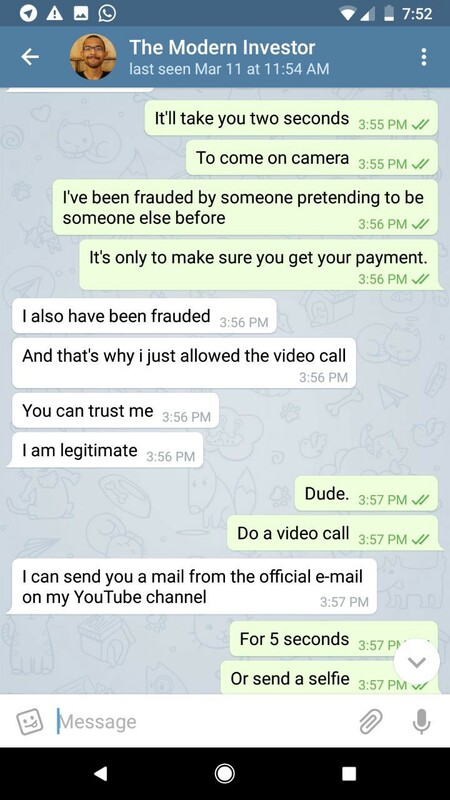 This was my first encounter with a Youtube fake on Telegram, so I was curious , yet careful. 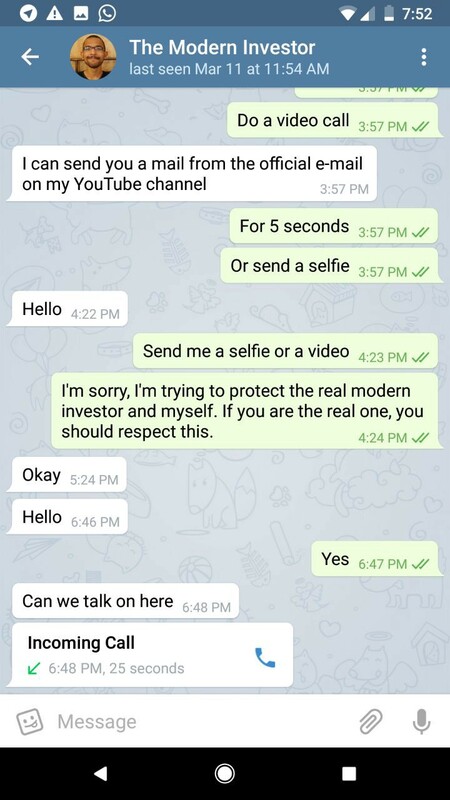 Before I made a payment, I asked him to hop on a quick video call or even send me a selfie, so I know it’s the real Modern Investor. After some reluctance, he agreed to get on a call. I burst out laughing at the seams when a thick Jamaican voice on the other end said “Are you ready to make da deel?”. Since we passed on him, everyone from Ian Balina to Suppoman have graced our channel with their presence, only to be kicked and banned within 10 seconds. One such individual, GLOBAL RASHID (Yep, all caps), sent me a PM telling me he’d love to promote Enkidu. Playing along, I asked him to send me an email from his professional id. Here’s the email I got. 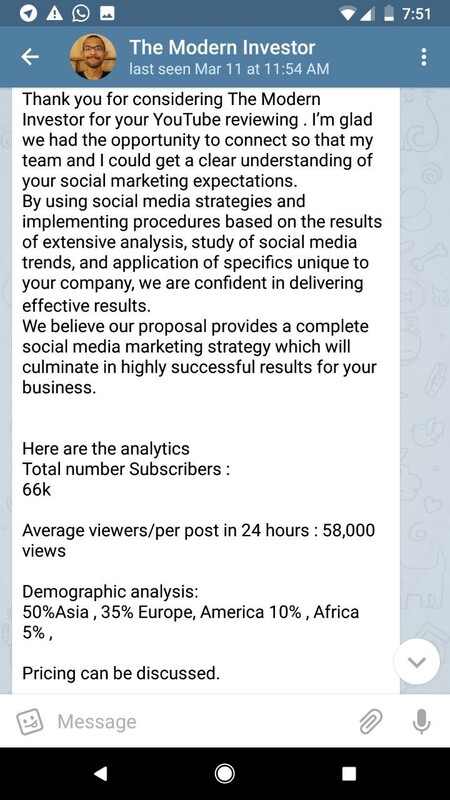 This one is the most annoying, because let me be honest- there are some people on Telegram who can actually help you out, bring you traffic and make great introductions. Picking the good ones out from the bad is incredibly difficult, especially as some of the successful con men out there have great websites and sophisticated background references. Until now, the scammers were obvious — they’d get straight to point, they’d have noticeable kinks in their presentation and no real background. But some are more complicated, and they’re out to take vengeance if you don’t fall into their trap! One such scammer reached out to us claiming he’d be able to get us a crazy amount of press. 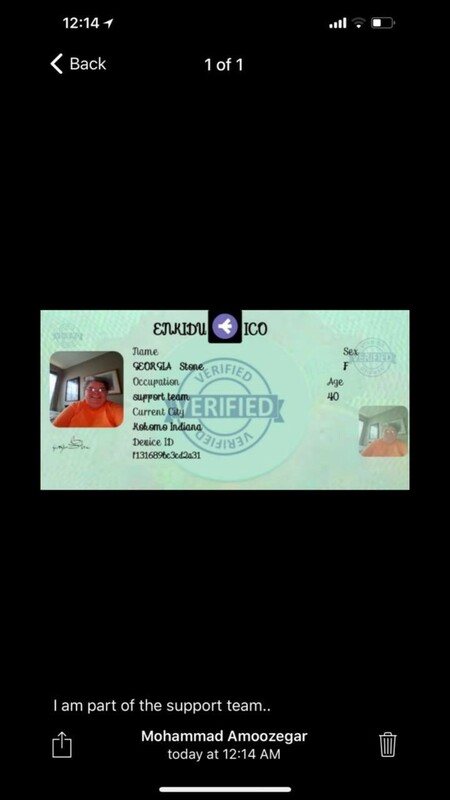 He shot me a sample of the kind of media he’d featured for another ICO. Lucky for me, the ICO in question was one who’s management we knew quite well. I reached out to the CEO and asked him if he knew someone called Greg, and if Greg has helped them do their PR services. As expected, “Greg” was unknown to him, and I didn’t even bother texting Greg back. All of this happened at 1AM, and I went to sleep right at my desk. 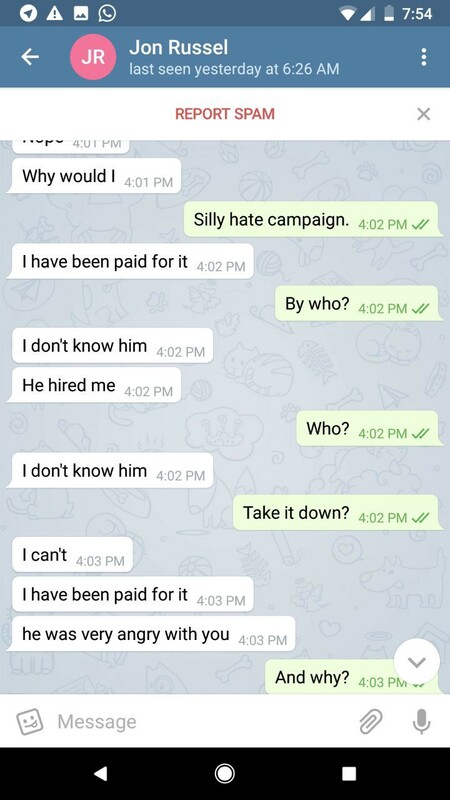 Apparently, I’d stolen 10 BTC from someone to start my company, and said person sent me a text, saying he was paid to put that post up. I knew the deal — these dudes wanted money, and if we sent them some money, they’d remove the report. 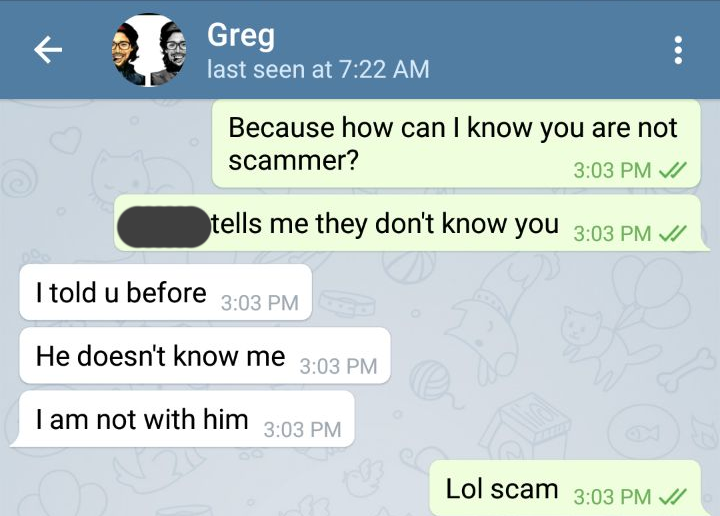 “Greg” was the only one I’d spoken to in the recent past who was obviously angry with me questioning his credibility, and I knew he was trying to extort some $$. We were extremely busy with the launch so I ignored the entire ordeal. 3 days later however, this is what I received from Greg. I didn’t bother replying, as I knew the next thing he’d say was to wire him some money. It’s a dog eat dog world out there, and the freedom to be whoever you want to be, wherever you want to be, is currently being taken advantage of by some folks out there. 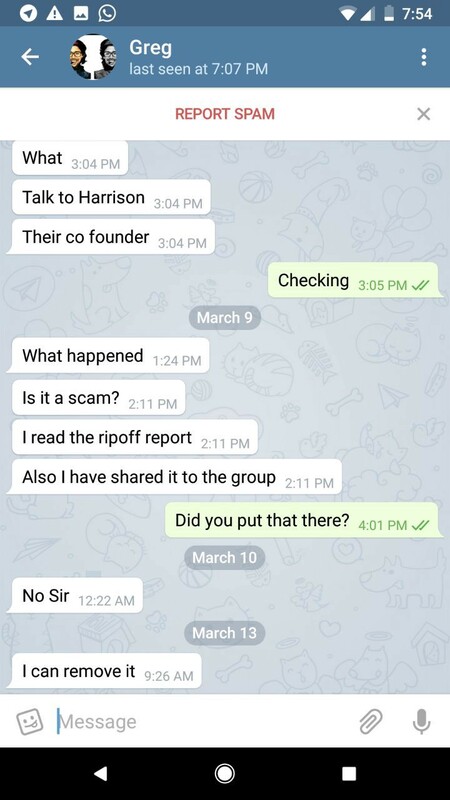 Most people in the Crypto world say “Hey it’s pretty obvious this is a scammer or a fake report”, but in my 7 years of startup experience, I’ve seen otherwise. 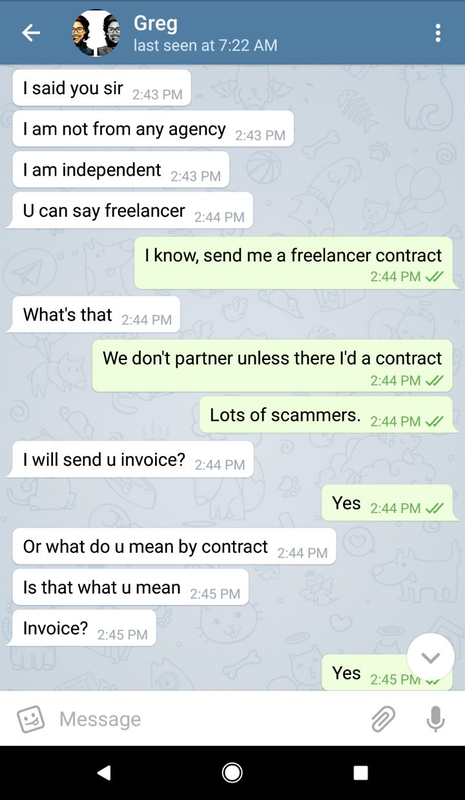 People fall for a lot of these, especially people new to the industry. Is this the kind of harsh greeting we want to give them? So far, we’ve only seen a bunch of incapable scammers — who are still raking in some money, mind you. Imagine what happens when the sophisticated scammers come along. As hilarious as it seems, there’s a more serious undertone to this article. Someone is going to get hurt, and as pioneers of a brand new industry, none of us are doing anything about it. Enkidu is a Blockchain based solution that allows teams to create companies instantly and run them at near zero costs, via an automated system. From dispute resolution to vesting periods, we’ve got it all. Join our presale now a enkidu.io!